Daytrippers is an absurdist, psychedelic rpg system for auteur game masters…No, I don’t know what that means either. Let’s find out! Daytrippers by Tod Foley is set in an alternate (hopefully) future. The game takes place in a world that has JUST discovered spacetime travel. And, no, I didn’t miss a blank space between those two words. Daytrippers explores the idea that space travel and time travel are closely related, and in fact, can both happen at the same time. Imagine if spaceflight had begun with one crazy dude in South Africa strapping a ton of TNT and Rocket booster to his car, and then launching himself into space. He returns a few minutes later, smoking, shaking, but with proof that he “made it into space”. After its initial discovery, several outrageous companies began funding their own spacetime programs, each one trying to discover valuable resources, gain power, information, or something else entirely. That’s how the game treats “SlipSpace” travel. It’s dangerous, unpredictable, and those who engage in it are crazy, bored, desperate, ambitious, or some combination of the above. In fact, that’s kinda how the game treats everything. In the author’s own words: “The world of DayTrippers is kinda dull, stupid and ridiculous, punctuated by spectacle, festooned with advertising and dripping with irony […] somewhere between ‘2001’ and ‘Idiocracy’”. This is where the “absurdist” subtitle comes into play. There’s a definitely element of snark and humor scattered throughout the rules, and I can imagine that most games play out like an episode of Mystery Science Theater 3000 (with commentary included!). Because the game is so quick to blend space and time, it’s easy for the same group to experience a wild variety of adventures in settings. This is the key advantage of this system. You could run a firefly-esque campaign where you build your ship, keep it flying, and do jobs. You could run a “Dark side of the Moon” game where you explore the psyche of an alien. Or go back in time to an alternate earth where Hitler rules supreme. OR….well, you get the idea. In that way, it’s very much like The Strange. But where The Strange has a focus on different worlds (from other books, games, media, etc. ), Daytrippers aims to explore the unknown and the truly strange vistas of existence. The basic rules use a dice-pool system, and the Stat score determines the size of your dice pool. So if your Might is 4, you roll 4 six sided dice when doing a strength task, and you keep the best one. Characters also have specific skills that are tied into a Stat. For example, the Medicine skill may be tied to Brains. You add your skill bonus to the result of your roll. This a neat little system where higher stat bonuses increase your chances of getting a good result, while skills increase the maximum value you can achieve. Characters can only score a max of 6 on unskilled tasks, while skilled characters increase both their max AND their minimum roll. I like this. I like this a lot, actually. It is simple, but it makes it very clear to the players how they should stat out their characters. Want to be really good at something? Increase your skills. Want to increase your chances of success? Increase your Stat scores. This is where the “Auteur GM” part comes into play. There are a lot of rules. Rules for poison, mental attacks, ship combat, cover, items, and more. Following and enforcing all of these rules seems a little overwhelming. Luckily, the Daytrippers GM Guide makes it clear that the GM is expected to tweak, emphasize, or ignore whatever rules they see fit. There’s even some optional “story gamey rules” to facilitate success with a cost, failure with a benefit, etc etc. The system is built to be more of a toolbox than a hard set of rules. In addition to advice about rules, the GM guide also features a unique system for running your games. It reminds me of conversation trees for games like Walking Dead; where you plan out some basic connections and reactions for your game. “If you kill Johnny, then Suzie will attack you.” But Daytrippers expands upon that, and gives you a framework for running your entire game session that way. Here is how a game based on Romeo and Juliet might be graphed. I think it might be a good way to handle larger, overarching plotlines, but it seems like a little too much prep to me (although, keep in mind that my idea of prep is a notecard with scribbles). And finally, my favorite part of any RPG supplement…Generators! Random generators for Missions, Stars, Planets, Locations, Lifeforms, Societies, Drama, Dream Worlds, and more! WHEEEEEE! Seriously though, these are great inspiration for your games, and give you some good ideas about the kinds of adventures that Daytrippers is geared towards. 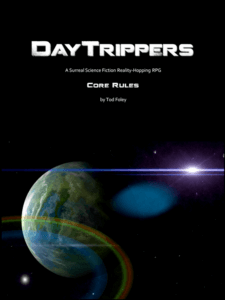 Daytrippers is a smart, on the nose game that tries to appeal to both old school, “Whitebox” type of adventures while leaving enough room for story gamers (Apocworld, cypher, FATE, etc) to run the game their way. Personally, I find it a little too “heady” for my current player group (the same problem I have with Nova Praxis). Players of Daytrippers must have motivations beyond killing guys and leveling up, a definite dealbreaker for many groups. But if you’re looking for something a little bit smarter, a little more surreal; Daytrippers provides the tools for GMs and players to try something fresh and different.